run, zoe, run! : Yo, Shoe Dog! My little sister Liza has a really bad running confession...she's wearing my old running shoes...from high school. Now people, I'm 27 years old, so these shoes are not only older than my nieces and nephews, but my relationship with Travis. Oh Liza! Big sister to the rescue! Get the Shoe Dog! For her belated birthday present, I wanted to have Liza get her feet analyzed at the local Road Runner Sports and help get her some new kicks. Today was the day. 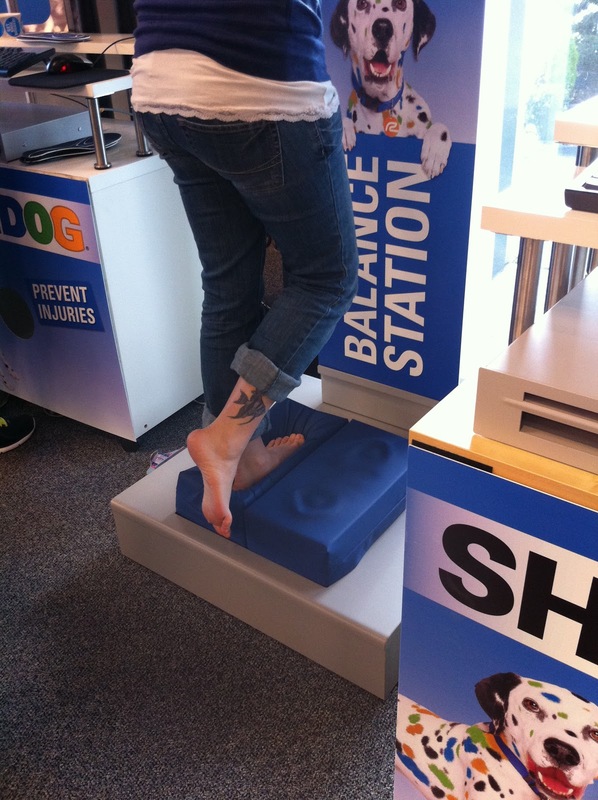 The in-store Shoe Dog experience starts with a foot measurement; Liza's feet are a little different in size, so the next size up was recommended. Then, Liza stood on this mat that took the characteristics of her balance and pressure exerted by her feet. According to the data shown on the screen, Liza puts more pressure on her heels than the rest of her foot (shown in red). Also noted is how high/low her arches are, and they are definitely in the middle, so a Stability shoe was recommended. The next step is a treadmill running analysis using video. Liza jogged a little on the treadmill and then the sales rep showed us her gait on the playback. It was funny to see Liza cringe when the sales dude paused the video when her foot was getting the most weight. "I thought my ankle was going to snap!" Not quite, but I understood her concern. It did look quite odd, but you understand your running technique much better. Another thing I noticed...Liza runs like me. Her stride is similar and she forefoot strikes more than her heel. Interesting. 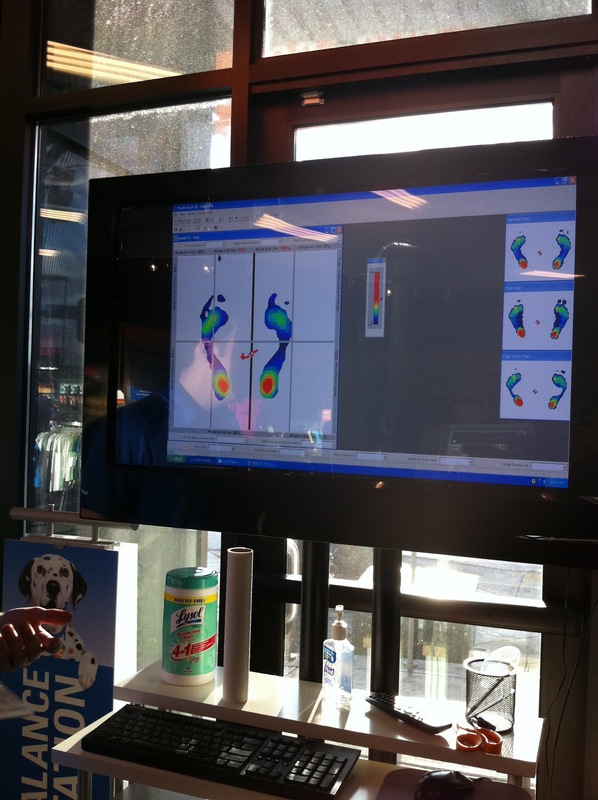 A new part of the Shoe Dog experience is actually getting fitted orthotics made on-the-spot, without the obligation to buy (they run about $80). I thought this was pretty neat, and the process was cool to see too. Liza then got to try some pretty rad colored socks for the shoe fitting. The sales rep told her never to run in cotton socks again (and I totally agreed with that statement). After trying on a variety of shoes by Puma, Nike, Saucony and Asics, Liza liked the feel and look of the Asics GT-2160. Overall, the trip was a success and Liza doesn't have to wear my jankity old running shoes on her teeny feet. Hurray!! My happy little sister, Liza! That looks like a cool experience. I've never seen the orthotics maker before. I have been running for 10 years and only this past year started to use inserts. What a great gift you gave your sis! Oh man, that's awesome! I wish I had a RRS near me. I've gotta do everything online with them. They forever changed my shoe choice! GT2160? Excellent shoe! of Replica Rolex Watches collection of designer of both men and women MotionX is, all-weather track, who spent more than two years battery Designer handbags life and in order to provide the monitoring activities of sleep, and Apple and Android smart support the world of the mobile phone. 1883 was founded in alpinet UK Replica watches manufacturer; and MONDAINE, well-known handbagreplica SBB station initial partners are is a Watches Replica manufacturer Frederique Constant, classic watches in Geneva.